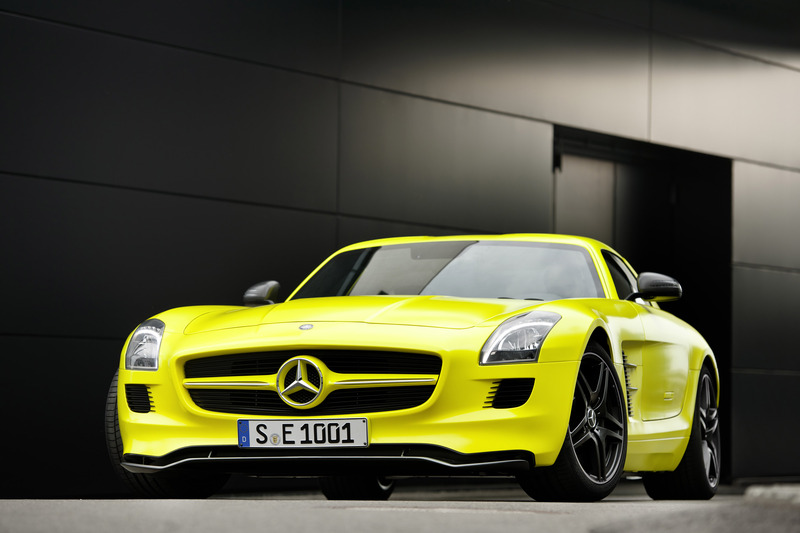 With the electric drivetrain system of the SLS AMG E-CELL, Mercedes-AMG GmbH is providing yet another glimpse of its latest development project. The drivetrain has been in development since 2010 as a result of the cooperation between Mercedes-AMG and Mercedes AMG High Performance Powertrains in Brixworth. Four synchronous electric motors located near the wheels, providing a peak output of 392 kW and torque of 880 Nm, help to provide the SLS AMG E-CELL with its exciting driving dynamics. The carbon-fibre transmission tunnel, which also serves as the monocoque housing for the high-voltage battery modules, is structurally integrated into the aluminium body shell and firmly bonded to it. The lightweight fibre composite materials have their origins in the world of Formula 1, among other areas. 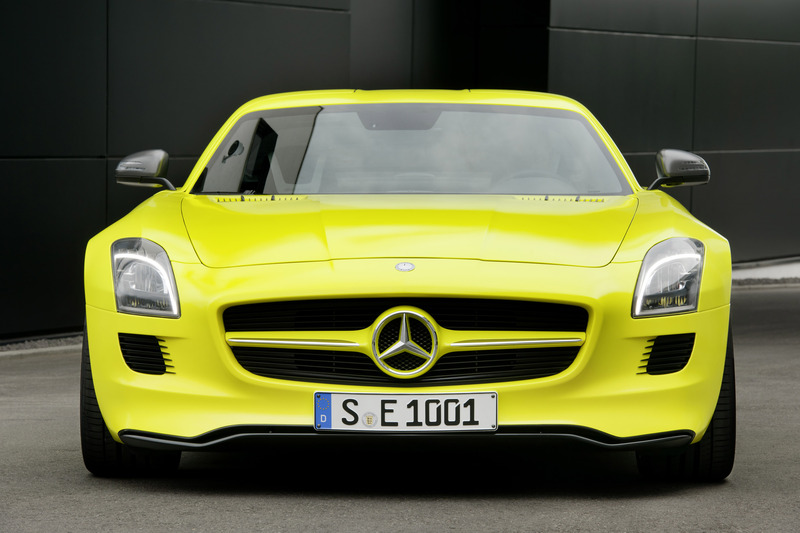 A small series-production run of the Mercedes-Benz SLS AMG E-CELL is expected to be launched onto the market in 2013. The powerful and locally emission-free super sports car with electric drive is yet another example of the innovative strength and development competence of the AMG performance brand. The ground-breaking drive system of the technology vehicle boasts some outstanding features: powerful traction is provided by four synchronous electric motors with a combined peak output of 392 kW and a maximum torque of 880 Nm. The four compact electric motors each achieve a maximum rotational speed of 12,000 rpm and are positioned close to the wheels. As a result, compared with wheel-hub motors, the unsprung masses are substantially reduced. One transmission per axle transmits the power. 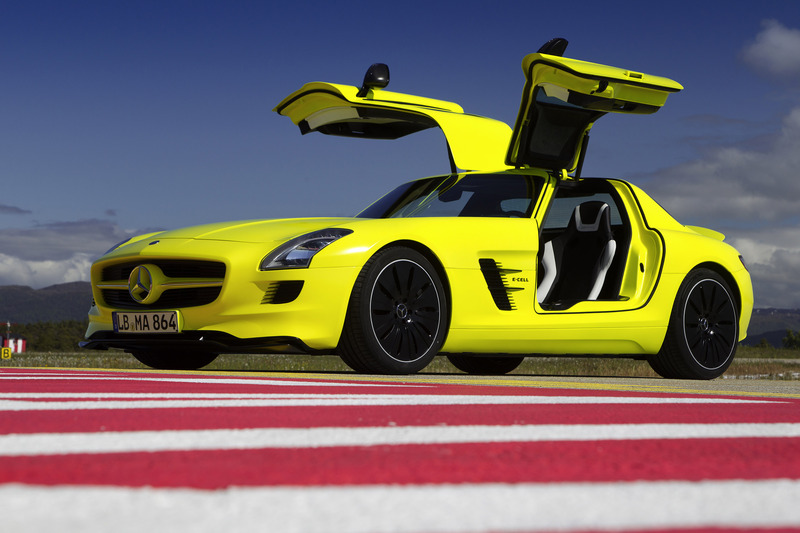 When it comes to dynamics, the electrically-powered SLS makes a statement: the gullwing model accelerates from zero to 100 km/h in 4 seconds – which almost puts it on the same high level as the SLS AMG with 6.3-litre V8 engine developing 420 kW (571 hp), which can accelerate to 100 km/h in 3.8 seconds. Further exciting touches are provided courtesy of the agile accelerator response and the straight-line performance: unlike a combustion engine, torque build-up in an electric motor is instantaneous – maximum torque is available virtually from a standstill. The spontaneous torque build-up and confident power delivery - which does not suffer from any interruption of tractive power - are combined with engine running characteristics which are totally free of vibration. Torque vectoring enables optimum use of the adhesion potential between the tyres and the road surface in all driving conditions, thereby extending the critical limits of the vehicle's driving dynamics. 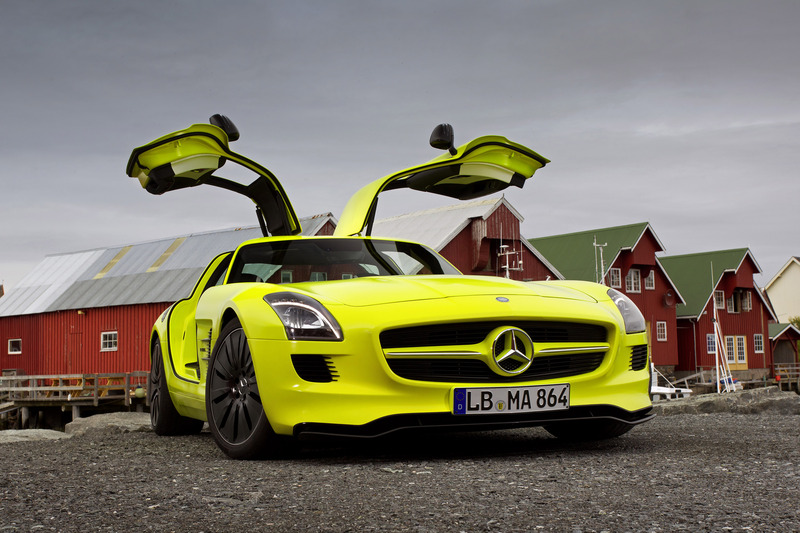 The SLS AMG E-CELL incorporates a liquid-cooled high-voltage lithium-ion battery featuring a modular design with an energy content of 48 kWh. 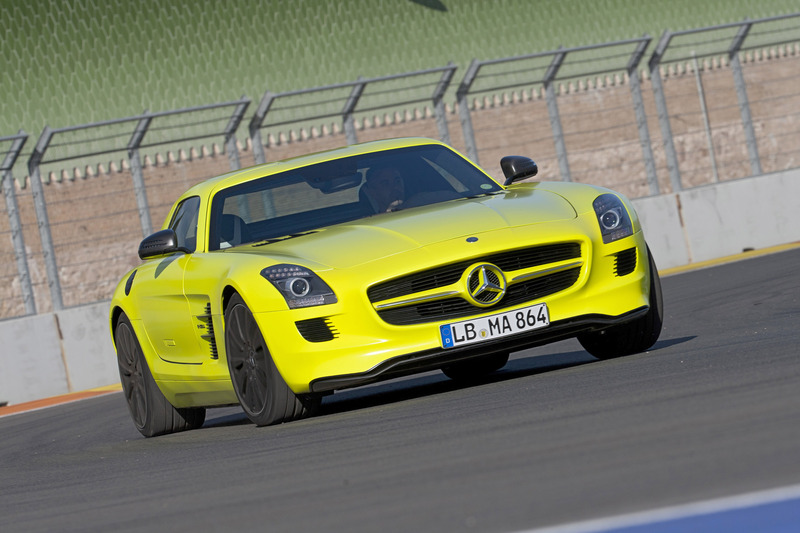 Its development has made use of advanced technology from the world of Formula 1: the battery is the first result of the co-operation between Mercedes-AMG GmbH in Affalterbach and Mercedes AMG High Performance Powertrains (formerly Mercedes-Benz High Performance Engines). Headquartered in Brixworth, England, the company has been working closely with AMG for a number of years. F1 engine experts have benefited from its extensive expertise with the KERS hybrid concept, which made its debut in the 2009 Formula 1 season. At the Hungarian Grand Prix in 2009, Lewis Hamilton achieved the first historic victory for a Formula 1 vehicle featuring KERS hybrid technology in the form of the Mercedes-Benz KER System. The high-voltage battery consists of 12 modules each comprising 72 lithium-ion polymer cells. This optimised arrangement of a total of 864 cells has benefits not only in terms of best use of the installation space, but also in terms of performance. The maximum electric load potential of the high-voltage battery is 480 kW, which is an absolute best value in the automotive sector. Another technical feature of this considerable performance is the intelligent parallel circuit of the individual battery modules – this also helps to maximise the safety, reliability and service life of the battery. As in Formula 1, the 400-volt battery is charged by means of targeted recuperation during braking whilst the car is being driven. 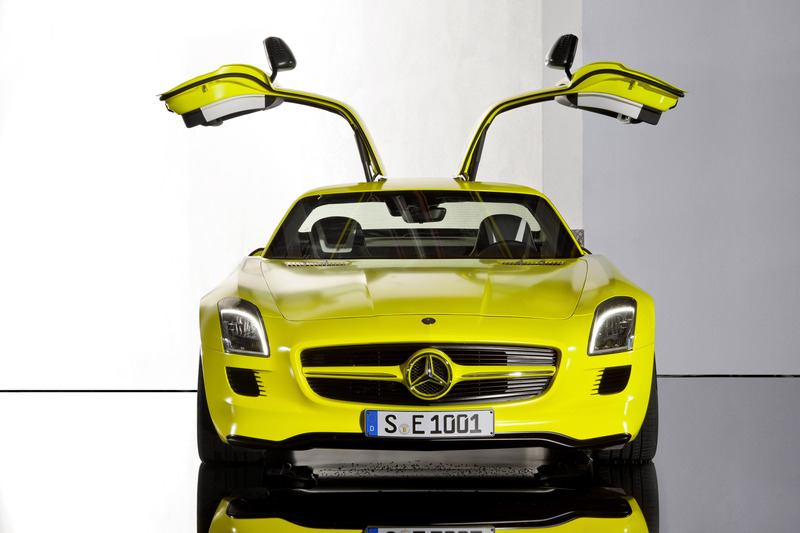 The trailblazing body shell structure of the SLS AMG E-CELL is part of the ambitious "AMG Lightweight Performance" design strategy. The battery is located within a carbon-fibre monocoque which forms an integral part of the body shell and acts as the gullwing model's "spine". The fibre composite materials have their roots in the world of Formula 1, among other areas. 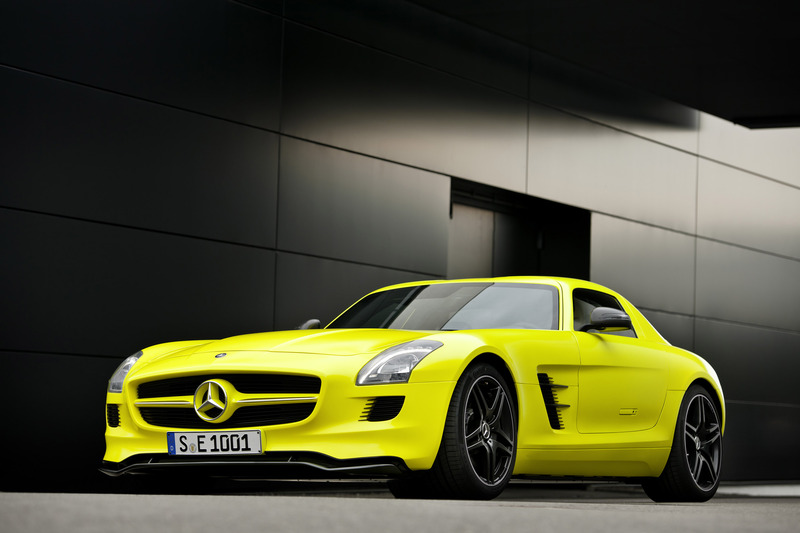 The advantages of carbon-fibre were exploited by the AMG engineers in the design of the monocoque. These include their high strength, which makes it possible to create extremely rigid structures in terms of torsion and bending, excellent crash performance and low weight. CFRP components are up to 50 percent lighter than comparable steel ones, yet retain the same level of stability. Compared with aluminium, the weight saving is still around 30 percent, while the material is considerably thinner. 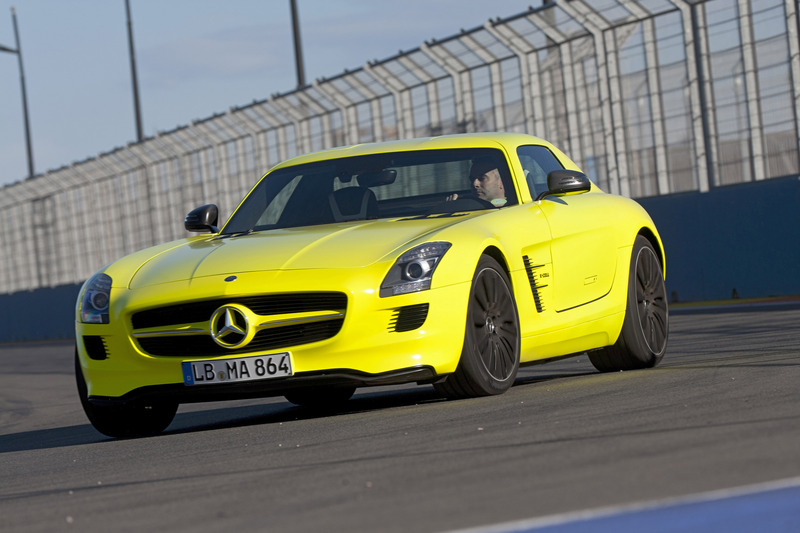 The weight advantages achieved through the carbon-fibre battery monocoque are reflected in the agility of the SLS AMG E-CELL and, in conjunction with the highly innovative wheel-selective four-wheel drive system, ensure true driving enjoyment. Through their experience with the SLR, the AMG Black Series vehicles and in motorsport, Mercedes-Benz and AMG have accumulated more than 10 years of expertise in working with carbon-fibre materials. 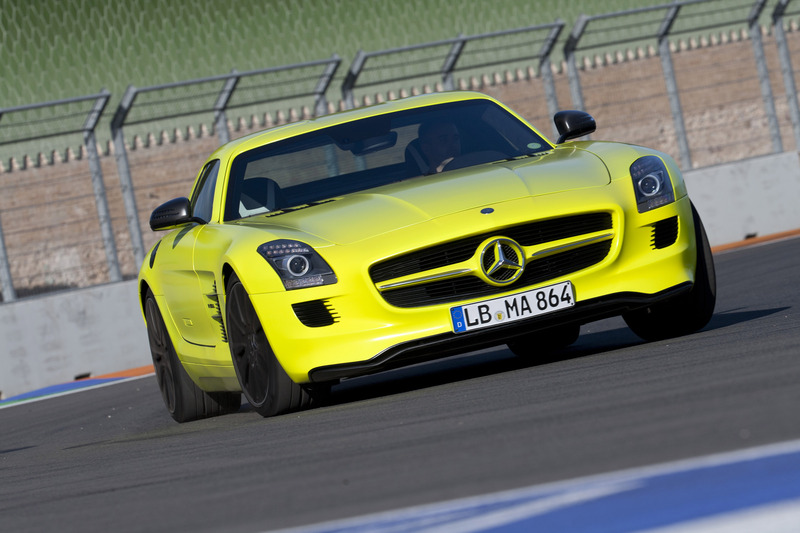 AMG currently makes the propshaft for the SLS AMG, for example, in carbon-fibre. 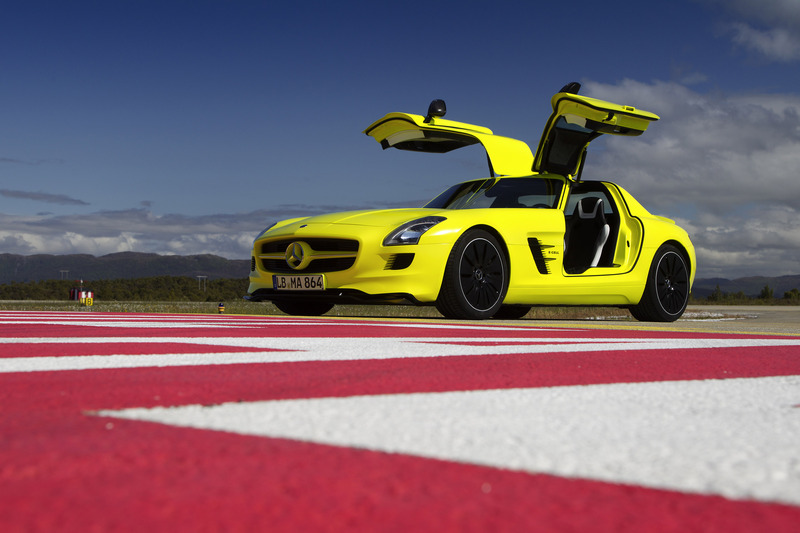 On the SLS Roadster, the supporting structure for the draught-stop is made as standard as a carbon sandwich structure. This component, with extremely short cycle times in an industrially oriented manufacturing process, already demonstrates what will be possible in the future. The purely electric drive system was factored into the equation as early as the concept phase when the gullwing model was being developed. It is ideally packaged for the integration of the high-performance, zero-emission technology: by way of example, the four electric motors and the two transmissions can be positioned as close to the four wheels as possible and very low down in the vehicle. The same applies to the modular high-voltage battery. Advantages of this solution include the vehicle's low centre of gravity and balanced weight distribution – ideal conditions for optimum handling, which the electrically-powered gullwing model shares with its petrol-driven sister model. 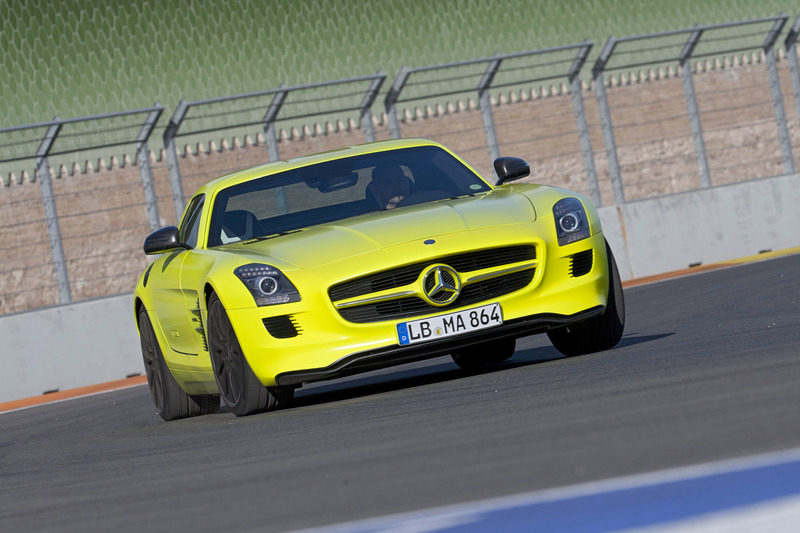 The additional front-wheel drive called for a newly designed front axle: unlike the series production vehicle with AMG V8 engine, which has a double wishbone axle, the SLS AMG E-CELL features an independent multi-link suspension with pushrod damper struts. This is because the vertically-arranged damper struts in the series SLS had to make way for the additional drive shafts. As is usual in a wide variety of racing vehicles, horizontal damper struts are now used, which are operated via separate push rods and transfer levers. Thanks to this sophisticated front-axle design, which has already been tried and tested in the world of motorsport, the agility and driving dynamics of the SLS AMG E-CELL attain the same high levels as the V8 variant. Another distinguishing feature is the speed-sensitive power steering with rack-and-pinion steering gear: the power assistance is implemented electrohydraulically rather than just hydraulically. The technology vehicle is slowed with the aid of AMG high-performance ceramic composite brakes, which boast extremely short stopping distances, a precise actuation point and outstanding fade resistance, even in extreme operating conditions. The over-sized discs – measuring 402 x 39 mm at the front and 360 x 32 mm at the rear – are made of carbon fibre-strengthened ceramic, feature an integral design all round and are connected to an aluminium bowl in a radially floating arrangement. The ceramic brake discs are 40 percent lighter in weight than the conventional, grey cast iron brake discs. The reduction in unsprung masses not only improves handling dynamics and agility, but also ride comfort and tyre grip. The lower rotating masses at the front axle also ensure a more direct steering response – which is particularly noticeable when taking motorway bends at high speed. The ABS and ESP® systems have been adapted to match the special application spectrum of the permanent all-wheel drive.